How does this cruise deal add up? Home/Cruise News, Cruise Ships/How does this cruise deal add up? I will never understand high finance. Norwegian Cruise Line has announced it is buying cruise ship Norwegian Sky, a vessel it has been operating for many years. NCL is 50 per cent owned by Star Cruises which is itself a subsidiary of holding company Genting Hong Kong. Norwegian Sky is owned by a company called Ample Avenue which is a wholly-owned subsidiary of, wait for it, Genting Hong Kong. NCL has been operating the 2,002-passenger ship under a bareboat charter, which means that while renting the vessel, they provide the crew, provisions and fuel. Under the new deal they are paying $260 million (£170 million) to buy the ship, giving Genting a profit of about $16 million (£10.5 million) on her current valuation. This is where I get confused. A company half-owned by Genting is buying an asset owned by Genting. Who is paying whom? Who raises the money, and where does the money go? Who is in profit after the deal is completed? The arrangement marks a new chapter in what has already been a somewhat chequered history for Norwegian Sky. The ship was originally ordered in 1993 by Costa, and was under construction at the Bremer Vulkan yard in Germany when the builders went bust. The partially-completed hull was laid-up until Norwegian Cruise Line bought it, ordered a re-design – which included two decks of balcony cabins – and had the ship towed to the Meyer-Werft yard in Papenburg for completion. The ship was christened in Dover in 1999 and made her inaugural voyage to north-east Canada – where she ran aground in the St Lawrence River, sustaining substantial damage which required lengthy repairs in dry dock. 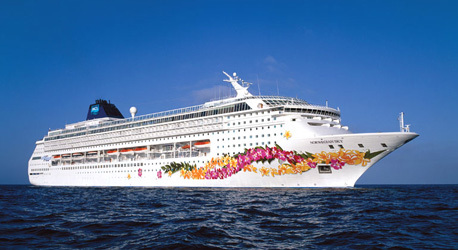 Four years later, NCL decided to move the ship to their NCL America brand and re-registered her as Pride of Aloha, sailing cruises from the US mainland to Hawai’i. When that operation foundered in 2008, it was reported that she would be transferred to Star Cruises to operate in the Far East, and also that Royal Caribbean were to buy her for their Spanish Pullmantur brand. In the event, the ship became Norwegian Sky once more, and now operates three and four-night cruises to the Bahamas from her base in Miami. Analysts say that Genting’s sale of the ship “is a good opportunity to realise a gain” which will be used to provide working capital and reduce debt. But what’s in it for NCL?